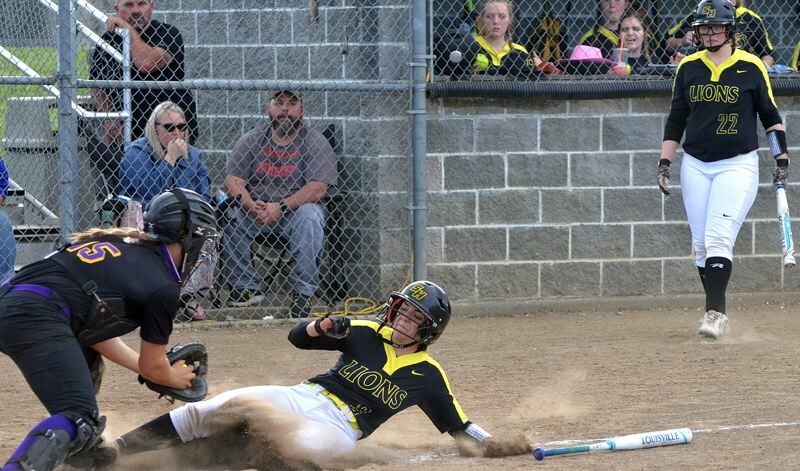 It all ended too soon for the St. Helens softball team. Madi Flores led off the final inning for with a single. Taylor Dow and Hallie Schwirse followed with RBI singles. And two outs later, Kortney Smith homered to center field to cap the scoring. Inning, ballgame, season, career for four Lions seniors. That four-run inning was quite an outburst. Unfortunately for the Lions, it came in the bottom of the seventh, after Hermiston had taken a nine-run lead. So, even that furious finish left the Lions with a 10-5 loss at home last Friday in their Oregon School Activities Association Class 5A Play-In game against the Bulldogs. The Lions bowed out of the postseason with a 11-15 overall record, after surging down the stretch with five consecutive league wins. Hermiston was able to strike first on Friday. The Bulldogs scored three runs in the third inning and built a 4-0 lead that was too much for the Lions to overcome. It was a 5-1 game when the Bulldogs bunched five hits and scored five runs in the top of the seventh. If not for that, the Lions' late flourish might have made things really interesting. "It would have been a little closer at the end. Maybe we would have done a little something," said St. Helens coach Miranda Little. "We fought," said junior shortstop Taylor Dow. "It showed we weren't ready to be done. Unfortunately, the fight was a little too late." The game ended with sophomore first baseman Brynn Austin hitting a hard line drive — right to center field. She crushed the ball three times in the game, but had nothing to show for it, as each shot went right to an outfielder. In all, the Lions had 12 hits, the same as Hermiston. "Unfortunately, we couldn't put together six innings like that last one, and string more hits together," said Dow. Hermiston's attack included a home run by Sydney Stefani, the junior shortstop who was the Columbia River Conference co-player of the year. The Bulldogs, who improved to 16-9 and advanced to the Class5A playoff bracket, were third in their four-team league. "The girls, for some reason, were a little hesitant at the beginning of the game (but) they picked it up. We've talked about how contagious hitting is, and that's what happened that (seventh) inning for us." Some tears flowed as the St. Helens seniors walked off the field for the final time. Second baseman Schwirse, left fielder Smith, third baseman Brooklynn Mercier and center fielder Trinity Degraffenreid all were starters. "It's a tough loss for our seniors," Little said. "We weren't ready for our season to be over. But for Kortney to homer in her last at-bat … what better way to go out?" Dow, a co-captain with Schwirse, put things into perspective as well. "It's hard to watch those seniors go — we're losing four really good athletes," she said. "(But) it was a heck of a season." Getting the lead in the game was big for Hermiston. St. Helens loaded the bases with two out in the bottom of the third on singles by Dow, Schwirse and Mercier, but couldn't cut into its 3-0 deficit. Mercier's triple in the fifth inning scored Schwirse with the Lions' first run, but the Bulldogs had seven hits in their final two at-bats to keep up the pressure. Hermiston got six innings, and then some, from starting pitcher Julissa Almaguer. The Bulldogs went to a relief pitcher to start the seventh, but had to re-insert Almaguer to get the final three outs. St. Helens hit into three double plays — two that started with shortstop Stefani and the other on a fly ball to right field and throw to the plate that ended the fifth inning. "They came to fight, and they capitalized on our mistakes," Dow said of the Bulldogs. "We hit the ball — we had a lot of solid hits that went right to people, and that doesn't help." Brea Paulson went the distance on the mound for St. Helens. She had six strikeouts and five walks. Little said she went with Paulson instead of Alise Gump in part because "Brea typically has fewer walks and normally forces teams more to hit ground balls to our infielders." The coach said Paulson did well battling "a little bit of nerves, veing a freshman in that situation and pitching before quite a crowd." Dow led the way by going 3 for 4, while Schwirse, Mercier, Pense and Flores all were 2 for 3. Dow, Schwirse, Mercier and Smith each had an RBI.